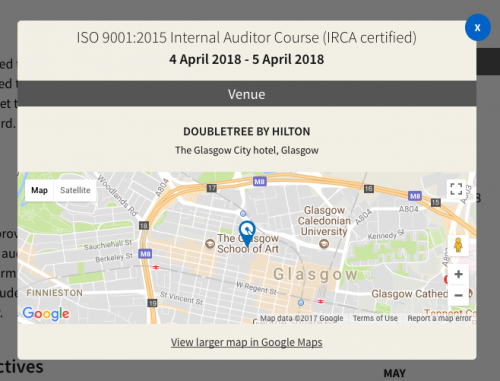 QMI Scotland are leading providers of quality systems (ISO 9001 / ISO14001) training, auditing and consultancy. They approached us looking for an updated website as their old site was difficult to update – and subsequently very out of date! 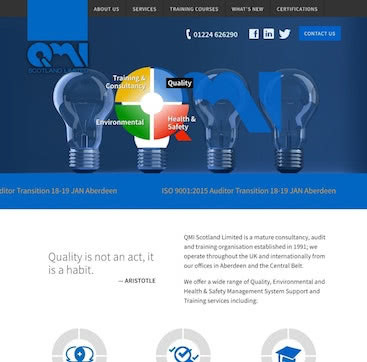 QMI run courses across Scotland on a regular basis and their course schedule is the centrepiece of their marketing. It was critical that any new site was (a) easy to update and (b) convenient to use on tablets and mobile phones as feedback from existing customers told them than many users visited the site using an iPad / tablet. We designed a custom backend system where they can enter and update the course and schedule details. The upcoming courses are pulled through to front page, where details of their training and consultancy offerings as well as the latest news give visitors a complete view of their offering. The course pages capture enquiries from prospective trainees and QMI saw a marked increase in booking enquiries when the new site went live. Finally the site was secured with an SSL certificate to increase security and customer confidence levels.